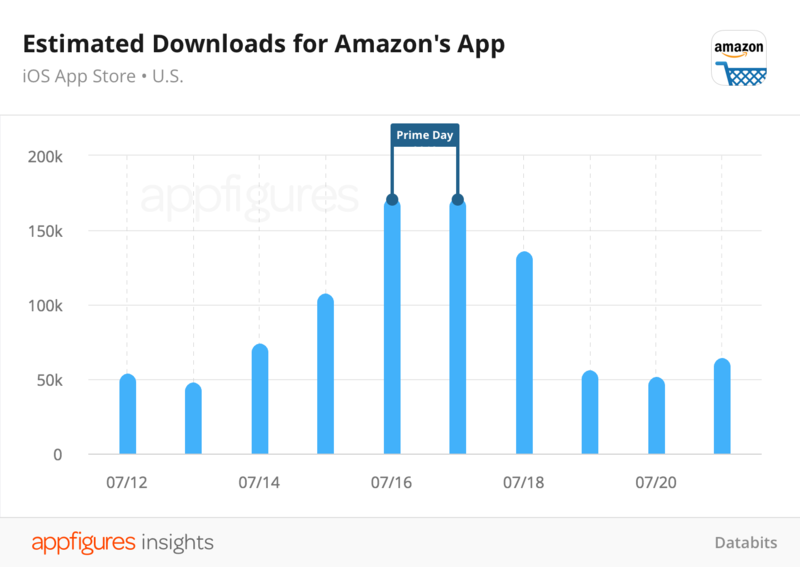 Prime Day is over, and even with technical issues early on, consumers showed just how much they love deals by downloading Amazon’s iOS app nearly 4 times more than on any average day. With revenue estimated to top $3.4 billion, Amazon’s new shopping holiday made waves on the App Store too. Not surprisingly, Amazon’s app rocketed to the #1 Top Free App in the US. 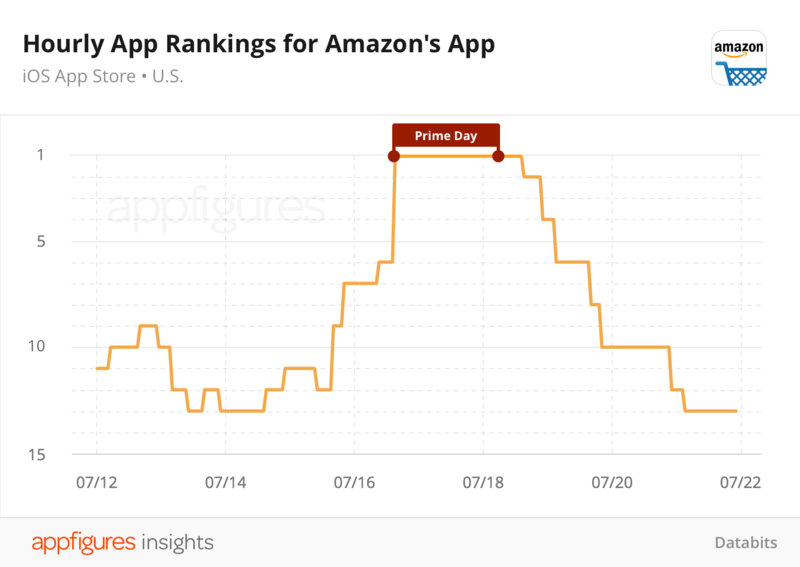 Although Amazon heavily promoted Prime Day outside of the App Store in the weeks prior, the impact was only visible in the hours leading up to the event’s start. What does all of the hype mean for downloads? We estimate that during the 36 hours of the event, the app was downloaded more than 350,000 times, a 4x increase when compared with the app’s average daily downloads of 44,000. Although Amazon’s app was the biggest winner, other shopping apps also benefited from this frenzy. General retailers like Walmart and Target, and marketplaces like eBay ran their own promotions to try and ride the wave — with mixed results. Dote, a lesser known fashion e-commerce app which makes brands accessible to shoppers through a virtual mall, started moving up the ranks towards the end of the event. Starting outside of the Top 100 they climbed to the 97th spot right as Prime Day ended and peaked at 16th the next day. 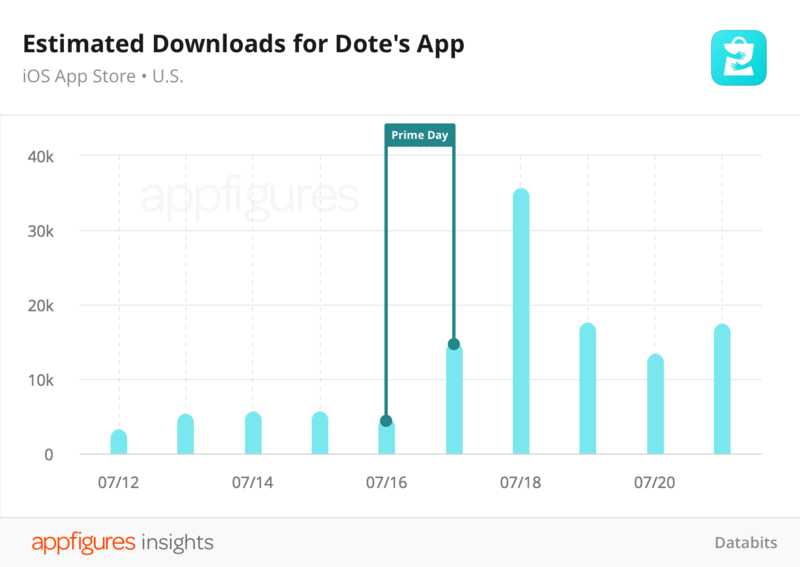 We estimate that this spike in ranks netted Dote a 7x increase in downloads immediately and a sustained 3x growth in the days after the event ended. Retailers used to rely on Hallmark to conjure new holidays out of thin air, but they’ve since taken the reigns to celebrate the spirit of shopping with holidays like Black Friday, Cyber Monday, Alibaba’s Single’s Day Sale, and now Prime Day. Ranks and download estimates for this report came from Explorer, our mobile market intelligence platform. Explore millions of iOS and Android apps with flexible queries, proprietary datasets like ad and SDK intelligence and app demographics, get actionable contact information, and more.